As the fiftieth anniversary of the Woodstock festival nears, Woodstock 1969 stands out for its singular voice. Photojournalist Jason Lauré followed his unerring instinct for being in the right place at the crucial moment. He and coauthor Ettagale Blauer trace the historic events that preceded the festival and then envelop the reader with photographs of the headliner rock stars that performed during the landmark three-day concert including the Who, Janis Joplin, Grace Slick of Jefferson Airplane, and Santana. Threading his way back and forth from the stage, through a sea of happy audience members, Jason Lauré photographed the communal life that was an essential part of the phenomenon that was Woodstock. Never intrusive, yet working close-up, he managed to capture these innocent moments in the pond and in the woods with the same compassion and intimacy he brought to his coverage of all the crucial events of the era. After Woodstock, he photographed such legends as Jimi Hendrix, Tina Turner, and Jim Morrison of the Doors. WOODSTOCK 1969 gives the reader an appreciation of the lasting impact of the festival, showing the way it changed the lives of all who experienced it. It served as the high point of the counterculture that started in earnest in the Summer of Love, and also as a leading influence in the decades that followed. 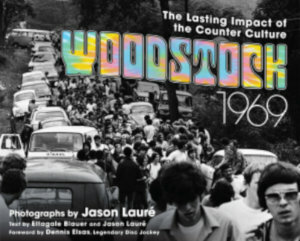 The book concludes with a look at Woodstock's lasting legacy, from Greenwich Village and the rock scene of the Fillmore East to the establishment of Earth Day and the burgeoning environmental movement. Jason Lauré moved to San Francisco in the famous "Summer of Love" and started photographing the counterculture. He attended Columbia University and worked at the New York Times before serving in the United States Army in France, where he attended the Sorbonne. He was a finalist for a Nieman Fellowship at Harvard University and was nominated for a Pulitzer Prize for Feature Photography for his work in Bangladesh. His photographs have been auctioned at Sotheby's and featured at the Hard Rock Cafe and at the Bethel Woods Museum. Ettagale Blauer is a full-time writer with expertise in Africa, diamonds, fine jewelry, and design. She is the author of several books, including African Elegance and a series on African countries. One of the books she coauthored with Jason Lauré, Joi Bangla! : The Children of Bangladesh , was a National Book Award finalist. Her work has appeared in several magazines including Rapaport and Art & Auction , and she has lectured at New York University and led wildlife and gem safaris in Africa.